If you’re like most people, your garage might not be the tidiest of places in your home. As a place that can be used in a number of different ways, you might use your garage as extra storage, a place to keep/use your tools, or if you’ve moved some of your stuff out of the way, somewhere to park your car. 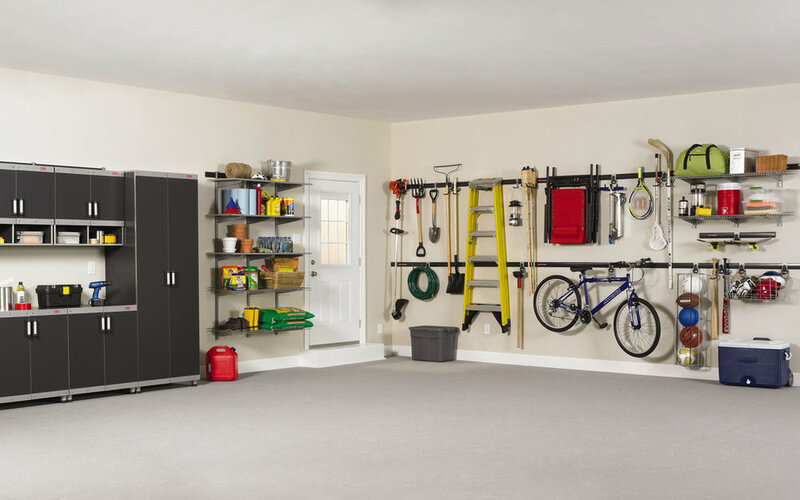 While thinking about how to organize your garage, consider some of the following tips to maximize the space that you do have. First and foremost, before you start moving and organizing things, go through all of your stuff to make sure that you actually need it. Often times, something will end up being stored in the garage on its way to being donated or thrown out. Have an old dresser, children’s toys, or box of clothes that you’ve been meaning to donate for a while? Start by getting rid of all of those unnecessary things to give yourself some space to work with. At the very least, move them out of your garage to organize everything else, then you can move the donation items to the very front as a reminder to get rid of them. With a cluttered garage, it’s easy to think that there’s not even an inch of free room anywhere. When you think outside of the box (or off the ground at least) you’ll see that there’s tons of free space on your walls and ceiling. There are more than a few cost-effective ways to use all of that open space. Coated garage hooks can be installed in your walls to get things like bikes or tools up off the ground. You can also look into installing ceiling mounted racks to store those rarely used items like Christmas or Halloween decorations. To free up space in your garage, look up! The garage can often be a catch-all for a lot of things. In order to organize your space further, try to separate your belongings into categories and keep similar things close to each other. Not only does this help with freeing up space in your garage, it’s also way easier to find that specific something that you’re looking for. Once you’ve sorted your things out, you may find that you’ve got stuff in your garage that could be stored elsewhere, like putting your yard tools in a shed if you’ve got one. If, after you’ve gotten rid of some things and used your wall space, your garage still feels a bit too messy, you can always add more space by installing shelves. Lots of people buy shelves, but you can also easily make some sturdy shelves yourself. With 1x12 pieces of wood and some brackets, you can make shelves that are as long as you need them to be. Making your own shelves is often a bit more space efficient, as they usually end up being thinner and/or mounted on the wall, but if you need more shelving space as soon as possible, store-bought shelves work perfectly fine, too. Organizing your garage can feel invigorating, especially if you realize you’ve been hanging onto items that need to find new homes. Consider donating some things, stacking or hanging the things you keep, and buying or making some shelves. Of course, it depends on how much is in your garage, but a dedicated weekend could free up lots of space!